When I was getting ready to fly from Cairo to Bangkok, the whole thing with the British bomb scare had just happened and there was all this talk of how you can't take liquids onto planes and blah blah blah. Well, when you're flying Egypt Air and not going to the US or UK, those rules don't apply. =) And besides, Egypt Air was using real metal utensils for their meals...spoons, forks, and sharp knives that could actually cut the food. So I don't think they were too concerned about security--I guess they know they're not the target, right? After about a 7-hour flight, I arrived in Bangkok around noon. It was warm and muggy, and everything was so nice and clean. After I got my luggage and changed some money, the first step was to get to my hotel. I had done some research before leaving (well, actually, I had done LOTS of research, as you'll see), and found that there was an airport shuttle bus which ran from the airport to a street near my hotel, which was MUCH cheaper than taking a taxi. I followed the directions I had to where the airport shuttle buses were, and lo and behold, they were actually there! So I walked up to buy my ticket and told them I wanted Bus #1, because I was going to Silom Road. They said okay, sold me my ticket, and then pointed me to a bus labeled "Bus #3." I walked up to that bus, and I asked the guy taking my luggage if this was really Bus #1, going to Silom Road. He said yes. I asked why the sign said "Bus #3." He peeked his head out of the bus to look at the sign as if that was new information to him, then shrugged his shoulders and said, "We haven't changed the signs." Well, that was good enough for me, so I got on the bus. The bus did indeed go to Silom Road, and I got off at the cross street for my hotel. I walked a block down and a block over, wheeling my luggage behind me. I soon arrived at my hotel, checked in, and promptly took a nap. Then I got up about 4 or 5 and decided to go out on the town. I walked down to the front desk and asked if there was a Starbucks nearby. The clerk said, "Oh, yes...there are Starbucks everywhere! One down the street on the way to main corner, and then one on Silom Road on the way to the Sky Train. Jackpot! So I stopped by and got a coffee on my way to the Sky Train, which is akin to Chicago's Elevated Train. Everything was automated, and there were actually escalators running up to it instead of just stairs. And everyone waited in line in the designated areas--no pushing and crowding the doors like in Egypt and Atlanta (and Paris and Frankfurt and New York and DC....). I had never seen anything like it, and I didn't know quite how to behave. I didn't figure out at first that people were waiting in line, because when I first got there, there weren't that many people. So when the train came, I just walked to the door, still in the mentality that if I didn't push and shove my way in, I might not get in before it took off. Then I realized that no one else was doing that, and that the train was waiting until everyone got on. Okay. 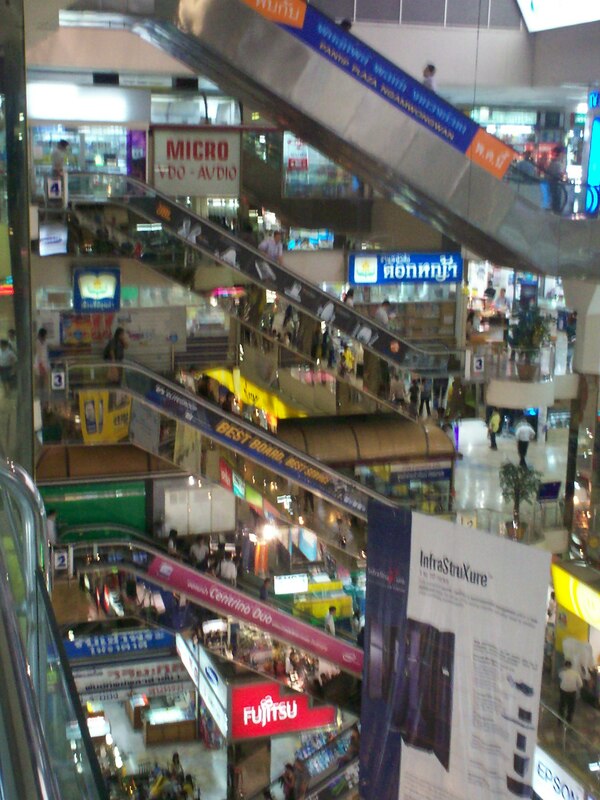 I soon arrived at my destination....the geek heaven that is Panthip Plaza. It is a six-story mall that is ALL computers and electronics and just plain geek happiness. You can buy all sorts of things there--genuine AND bootleg. I didn't buy any bootleg, but I DID purchase a new digital camera, since my old one (the venerable SpyCam) was starting to act up. I got the new camera cheaper than I would have in the U.S. or Egypt, and it has worked wonderfully. After buying the camera and checking out some of the other items in the mall, I headed down to the Food Court. And guess what they had there? An A&W, serving REAL hotdogs with pork in them! So of course I just HAD to get one. After the delicious hotdog, I walked back to the Sky Train and headed back toward my hotel. However, on the way to my hotel, I saw a place advertising spa services for really low prices. These places are all over Bangkok, and I had thought earlier that it might be nice to get a massage, since it would be cheaper there than on the boat. So I went inside and ended up getting a pedicure and a 75-minute massage for a grand total of $14. Awwww yeahhhh! The massage was funny though, because the masseuse was really determined to get the knots out of my shoulders. In this parlor, and since this was just a neck and shoulder massage, I kept my clothes on and just had the massage out in the front room where all the other customers were, and where people from the street could look in and see. Well, the massage started out with me sitting in the same chair where I had had the pedicure done. But after a while, the masseuse realized he wasn't going to get the knots out with me in that position. So he had me put my knees on the pedicurist's stool and lay my elbows in the seat of the chair. Then he went to town on my shoulders. At one point he had me put my arms behind me with my hands joined together. He grabbed my hands and pulled back while pushing his knee into the knot to get it out. He finally succeeded, but the whole thing must've looked incredibly painful because one of the other customers hesitatingly asked, "Now the massage I signed up for isn't gonna include THAT, is it?" With knot-free shoulders and beautiful red toenails, I continued on my way back to the hotel. The streets were really alive; I guess Thais are into late-night culture just like the Egyptians are. As I lay down to go to sleep, it hit me that I had not heard the Islamic call to prayer all day! That thought, along with the realization that I would probably NOT hear it for about 17 more days, sent me to sleep with a smile on my face.